This is my favorite way to cook bacon. The process is easy and convenient, but the kicker is that the end result is bacon that is succulent and flavorful. Let’s talk about what is happening when you cook bacon. The first result of heating the bacon is that the fat is rendering and whatever water is retained in the meat is evaporated. With the fat rendered out of the pork belly, the Maillard Reaction results from browning the meat and flavor is developed. Simple in concept, the challenge is that as the fat renders out the bacon gets crispy, which I happen to like but is not bacon in its ideal state. Insufficient cooking leaves the meat fatty and lacking in sufficient browning and nobody really likes soggy bacon. Cooking bacon in the oven or microwave are methods to get around these challenges with cooking bacon, both rely on specific application of controlled heat to overcome overcooking the bacon. 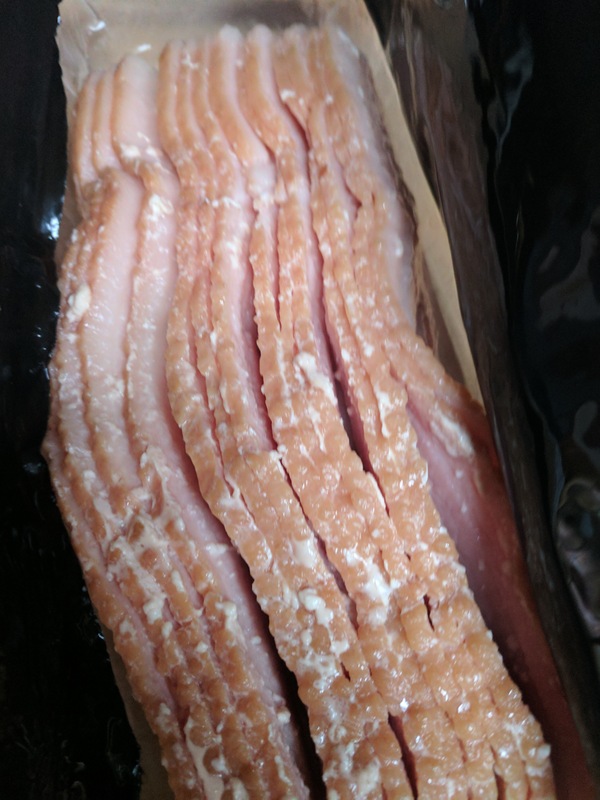 However, sous vide cooking an entire slab of bacon is better than any other method because it renders the fat out of the bacon without actually applying direct heat at all, and it’s super convenient because you can take an entire slab of bacon from the market and drop it in your sous vide without any prep at all. Cook the entire slab, sear to serve a specific portion and then refrigerate the remainder for a later date. I prefer thick sliced bacon but this method works with any bacon type. 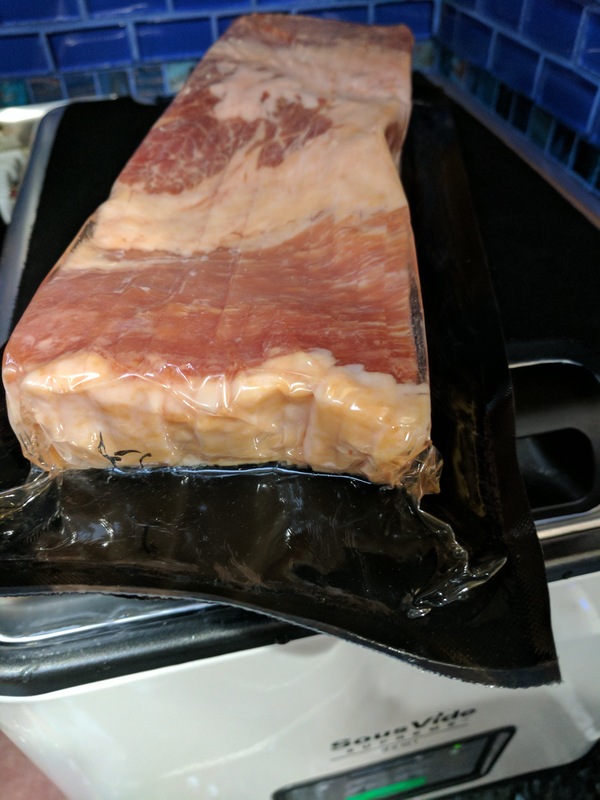 The vacuum packed format that bacon comes to you from the market is perfect for sous vide. Temperature and time are flexible, I prefer 145 degrees for anywhere from 10 to 24 hours. Remove from the sous vide and pierce the package to drain off the liquid. At this point the bacon is fully cooked but unappetizing because it lacks color developed through the searing process. The Maillard Reaction has yet to do it’s magic. Preheat a cast iron or steel pan with high heat and sear slices of bacon for 1-2 minutes each side and serve. Refrigerate the remaining bacon and it will be ready to serve at a later date with no more effort than searing.